Estate planning is about more than who gets the family china when someone dies. What happens during a person’s life also needs consideration. As people age, at some point, many realize they need assistance to deal with daily life issues. Florida, being home to many retirees, has a large segment of its population that could find themselves unable to make decisions about their personal or financial affairs due to physical or mental impairments. This decline can be slow and gradual, or sudden and unexpected. Consequently, planning for this possibility before something happens is the best way to ensure disputes do not arise among family members, and to adequately provide for the needs of the impaired individual. When someone is unable to make decisions on their own behalf, they understandably want to transfer that responsibility to a person that knows them well and can be trusted. This most often turns out to be the person’s children. While it may seem adequate to simply tell one’s children how they want their personal and financial issues handled, the children need legal authority to make decisions in order to truly provide assistance to the ailing parent. In addition to executing the proper legal documents, at least one person needs to know where the documents are located so there is no unnecessary delay or confusion over who is supposed to take over responsibility. An overview of several key documents older individuals need to create to protect their physical and financial wellbeing in case a serious illness or accident strikes will follow below. Powers of attorney can grant another person, often a family member, as an agent, with the authority to make decisions on behalf of the individual who creates the Power of Attorney. Some examples of their use include opening or accessing bank accounts or financial accounts and buying or selling property. There are three types of powers of attorney that differ according to when and how much decision-making power is granted – General Power of Attorney, Limited Power of Attorney, and durable power of attorney. General Powers of Attorney grant another person broad power to make decisions on the creator’s behalf, and a list of the matters on which the designated person is authorized to act must be included within the document. Limited Powers of Attorney only grant the designated agent authority to act for a specific purpose, such as selling a home, and the Limited Power of Attorney cannot be used for any other purpose. Powers of attorney automatically terminate when the creator becomes incapacitated, however, a Durable Power of Attorney remains effective even in the event of incapacity. A Durable Power of Attorney can be limited or general. All Powers of Attorney terminate upon the death of the principal. A Living Will is a written statement or directive, wherein the signor states a person’s desire, if he or she cannot communicate his/her wishes, that life support be withheld or discontinued if certain circumstances exist. To implement the directive, two medical doctors must initially concur that death is imminent or that you are in a persistent vegetative state, and that there are no further medical procedures that would provide any reasonable prognosis of recovery. The signor may designate a representative in the document to then be allowed to determine the appropriate time to implement the directive. In addition, Florida also allows individuals to designate a health care surrogate with the authority to make a wide range of other health care decisions if they become unable to so. Finally, everyone should at least have a basic Will in place that designates which persons or entities are to receive their property following death. Trusts may sometimes be beneficial, and are often used in to provide more flexibility in the distribution of property, and to minimize the costs of probate. Many different types of Trusts exist for various situations. An experienced estate planner can advise a person on the best options based on his/her goals and financial situation. Leaving your family with no authority or direction on how to manage your health care or other interests can lead to disharmony among family members. 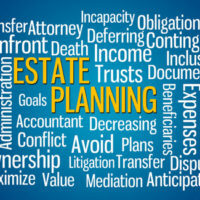 Taking the time to work with an estate planning attorney and drawing up the appropriate legal documents can minimize costs, misunderstandings, and family disputes. Attorney William Rambaum, a Board Certified specialist in Elder Law, can assist you in establishing the plan that is right for you and your family. Mr. Rambaum’s office is located in Oldsmar and serves the greater Clearwater area; contact us today to schedule an appointment.